Courtney Pulitzer's Cyber Scene: Mrs. Mayor, I have an idea! 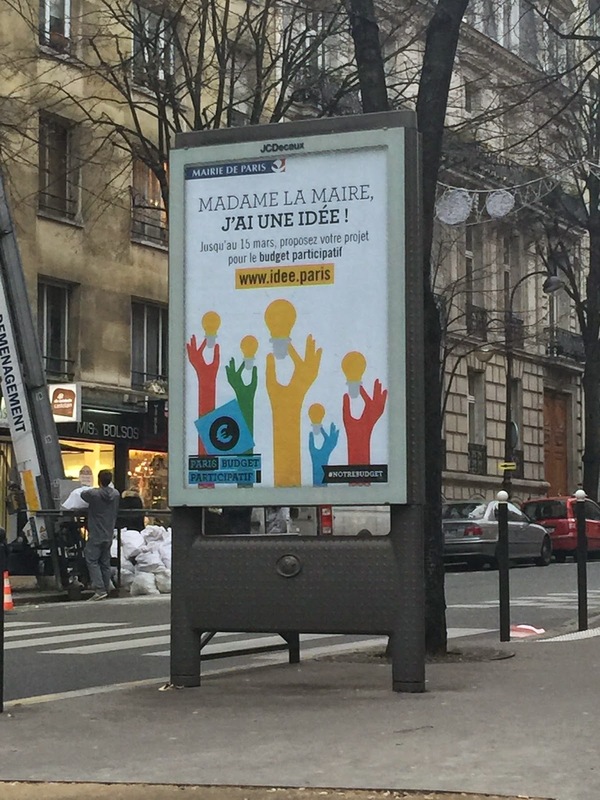 Starting in the beginning of 2015 these posters have been popping up on various scrolling billboards throughout Paris. They say "Madame Mayor, I have an idea! Until the 15 March you can propose ideas for the participative budget." I love this idea! I always have so many ideas that I think would improve "customer experience" (i.e. inhabitants) lives in Paris. Of course, posed with this opportunity, I am sadly drawing a blank as to what to propose! Have I adapted so much to differences in this city, country, culture that originally bothered me? Now there is a novel idea!